No Returns: Please make sure you are ordering the correct Doorbell Box for your application because there are no returns or exchanges on this product. Please see details below. Application: If your Video Doorbell has two screws protruding from the bottom that must be used for installation, order Item# 88002 that has two additional holes on the bottom to allow access to the screws. These "Security Screws" require a special screw driver that is provided with your Video Doorbell. Some Video Doorbell models allow you to snap the unit onto the base without the need to tighten the screws. If that is the case with your doorbell, Item# 88001 will work. However, if your unit will not stay on the base until the screws are tightened, or if you want the extra security the screws provide, order Item# 88002. Type "88002" into the search window above or click the link below for the Wireless Doorbell Box®. Check the packaging to see if you have a RING 2® or RING PRO® version and go to the appropriate related product below. Installation: A clear plastic cover (not pictured) is included with your Doorbell Box® which should NOT be used when you install your Doorbell Box®. Leave the front open to allow the motion sensor to work, and to allow access to the doorbell button. Use the clear cover only to further protect your Video Doorbell during exceptionally extreme storms when driving rain or blizzard conditions are forecast. Secure the cover with paiter's masking tape during the storm. Remove the cover after the storm has passed. Mount Anywhere: If you are mounting your Video Doorbell in a remote location that does not use existing doorbell wiring, you may wish to order the Wireless Doorbell Box® instead that provides access to the Security Screws on the bottom. Item# 88002 is designed for Video Doorbells that will require removal for periodic recharging and use of the security screws is desired or required. Type "88002" into the search window or click the link below. Protect Your Investment: The Doorbell Box® helps to protect your video doorbell from driving rain, ice storms, blizzard snow storms, high humidity and other adverse weather conditions. Although weather-resistant, these video doorbell devices are not water proof or moisture proof. Unless you live in a sunny climate where it never snows, never rains and there is no humidity, moisture will collect behind it, and your video doorbell will eventually fail. 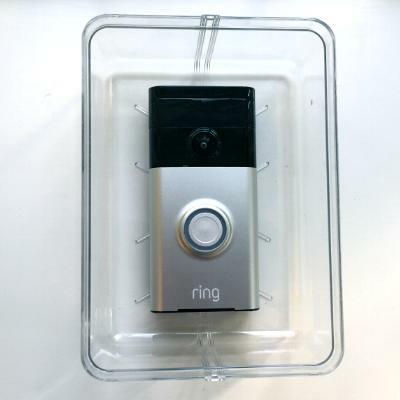 The clear plastic cover will further protect your video doorbell and will even hold up during a hurricane.